Paranormal Pop Culture: Is Stephen King’s 'It' Heading to the Big Screen? Is Stephen King’s 'It' Heading to the Big Screen? Stephen King’s “It” may finally be getting its big screen remake. Two years ago that it was announced that the 1986 book would be getting a new film adaptation but little has been heard from about the news since. Writing and directing the film is Cary Fukunaga who has currently directed all eight episodes of HBO’s “True Detective” with Matthew McConaughey and Woody Harrelson. According to the film’s producer Dan Lin, “The show has been a massive hit with both fans and critics.” and he can’t wait for Cary to get started on the project. Currently, Cary Fukunaga is on location in Africa filming an independent film called “Beasts of No Nation” and once he’s done he could possible start on the “It” project unless a second season of “True Detective” or some other studio interference gets in the way. “It” could possibly be a two movie deal, as originally proposed, or be shrunk down to one. Once Cary gets started on the script more details will be available. 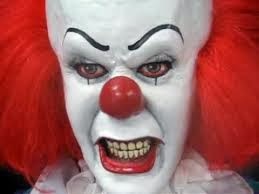 However, Tim Curry’s unforgettable performance as Pennywise the Clown will be hard to top.